1/25 – Signed free agent LHPs Jeremy Bleich and Edgar Ibarra to minor league contracts. 2/3 – Traded LHP Jesse Biddle to the Pittsburgh Pirates for RHP Yoervis Medina. 2/3 – LHP Evan Crower assigned to the GCL Phillies. 2/3 – LHPs Jeremy Bleich and Edgar Ibarra assigned to Lehigh Valley. Medina and David Lough were both invited to spring training as NRIs bringing the total player count to 64. Only one small rant this week. MLB’s Hot Stove had too much super bowl coverage. Oh, and how many days are they going to over-analyze the Juan Segura trade. Eventually, I bailed out on the network. I’ll try again next week. 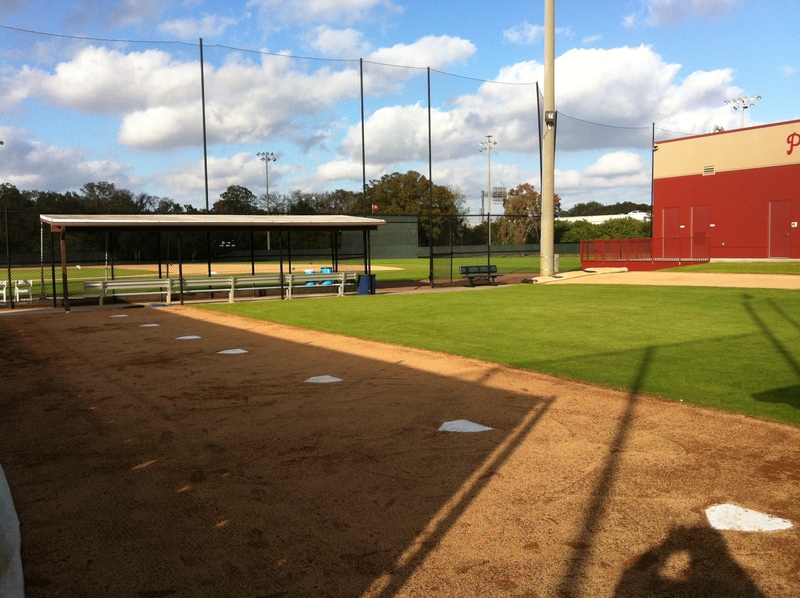 Here are a couple pictures of the pitchers area at the Carpenter Complex. This space is off limits during spring training. I have always wanted to see it, so I jumped a fence and out ran an elderly guard. Yes elderly, older than I. 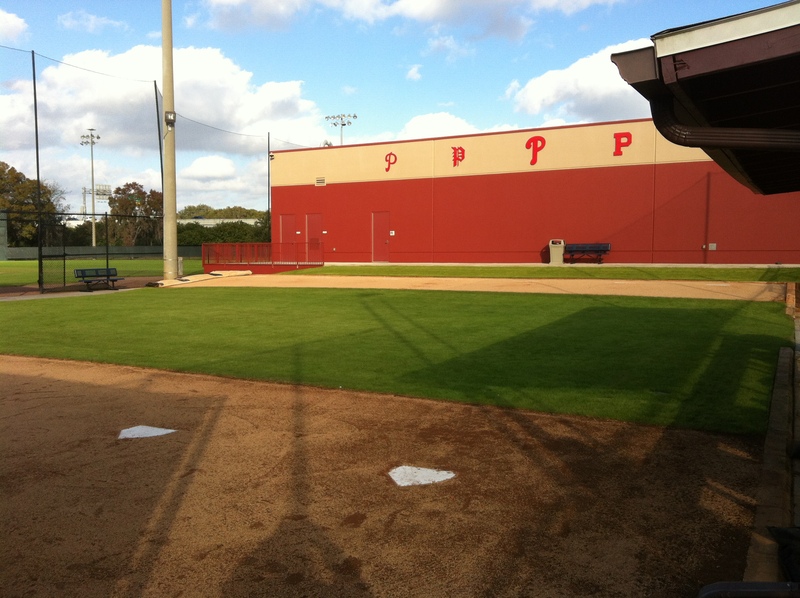 The building in the background is the Phillies state-of-the-art weight training facility and indoor batting cages. The Seven Mounds stretch across the face of the building. When the Complex is in full baseball use, benches are placed along the wall for the coaches. If you’re going to have an area named the Seven Mounds, you’re going to need seven plates. The ball field in the background is Roberts Field. He didn’t deserve a 40 man roster spot, has gotten worse for the last two years, and has proven nothing and is out the whole year. What would you like them to do? He had to go through waivers. They could have not DFA’d him in the first place. Seems to me they took a risk that he wouldn’t be claimed and they lost. What is he worth??? Arm injury. cant pitch until next year. Hasn’t been consistant. The only thing he has is he was a high draft choice. I’m guessing Biddle was traded because a team tried or was going to place a claim on waivers for him. Would have been ok for him to sit all year and attempt to come back in 2017. But yes he did not deserve to be on 40 man roster. Good luck in Pittsburgh, they do great with reclamation projects. Hopefully by 2017 the young arms will make us forget him. Biddle probably will not pitch competitively until ST 2017, then go to Indianapolis (AAA), and only be called up if he rakes and/or there is an injury to a Pirate staff. So he may not see the majors until early 2018. Of note: Sweeney ranked very high, in stark contrast to our poll. What I find amazing are the names listed who are NOT in the Top 20. The Phillies have done a great job at increasing depth. We all were pulling for Biddle. He maybe would’ve seen a mound in 2017 barring any set backs. And 2017 would’ve been his own personal rebuilding year. So we would have maybe seen him in Philly in 2018. And possibly as a reliever. 8 years in a system to hope for a serviceable bullpen arm would’ve been too long for me to wait. I wish him luck in Pitt. The Phillies have to at least be keeping tabs on Ian Desmond’s situation. I get the 2.1 implications, but we’re talking about a player who at minimum is likely to warrant another QO after the 2016 season. Desmond, and few others not yet signed, would be something to consider, possibly in also flipping him in July/ or a .August waiver deal. For the owners to take this off the table, what would the MLBPA give in return? Unfortunately the MLBPA would probably do something along the lines of making Latin American players eligible for the June draft to get this concession. They’ll sacrifice the group with the smallest voice. The LA group actually has a larger voice than what many think…almost 30% of MLB players are Latin Americans and they put a stop to a separate international draft four years ago by threatening to strike, when Bud S was commissioner and wanted to initiate it. They still want an open market for the LA kids. They are the group, along with supports from the Latin countries like reps/buscones who are holding it up. I have little sympathy for Desmond or his agent. They chose to turn down a $100m offer from the Nats earlier and now it’s haunting them because they overplayed the market. He will eventually get a decent deal but it might take until ST..
Yeah, Desmond made a terrible mistake by turning down their 100 million dollar offer. But he was producing like a 100m+ player at the time. He must be having a lot of sleepless nights knowing he probably cost himself at least 50 million dollars over the rest of his career. Makes no sense for the Phillies to keep an eye on Desmond. Of all of the places that they could use a short-term veteran SS isn’t one of them. Crawford will be ready by late 2016 but probably 2017. Why give up a high draft pick for a rental player with the hopes of flipping him in the season for a trade. If he has a bad year/attitude, then that goes away too. Great pics Sb winner Peyton Manning class act go out on top. That Denver D eat up cam and Company. I called Denver 21 to 16 was a little off on the score. I haven’t bet in a long time but could made money on the game . A couple peeps I know we’re all over Cam for a wk I’VE been saying Von miller has him.Anyway after this yr do the Phillies need to make coaching changes or is the staff they have now good enough to win . I don’t know the pitching coach was like the Phillies 5th choice . The Phillies new BP coach has a good looking resume . Mackanin looks the kids like him but do we want a proven winner. Get this the hell off of here. Good write up…..even Cozens is 90 on their Top 100 ‘often-questioned’ KATOH list. I have 65 players. On about 25 sites Cedric Hunter signed on Jan 4 with the Phillies and had an invitation to spring training. MLB keeps up the site and may have missed this. It was in The Inquirer today that 65 players were going to report to Spring Training, so it looks like Cedric Hunter is the 65 th guy. Jesse Sanchez reported that Phils are one of 9 teams in on Lazarito…decision could be today. Also Phils very active in Latin America and should have a solid class of signings 7/2. Zolecki retreated story. Sorry no link. Last I heard, tomorrow seems to be the day they keep claiming he will sign. However, with nine teams in the mix, I think that is a little rushed. But the Braves seem to be the one mentioned the most in getting him inked. Saw somewhere that either KLaw or Jim Callis said he was still very raw. But he is 16-years old…they all are raw at that age. If the Braves actually do sign Armenteros, that may be a good thing for the Phillies. That means Ven phenom Kevin Maitan who was rumored to be a Brave favorite come July 2nd, could now be on the open market in July…and the Phillies would have the most money. Plus the Braves would be penalized from signing anyone over the $300K threshold. Unless the Braves or whoever, convince Armenteros to wait until July to sign. Good overview of the BA Handbook. Ben Badler has Nick Williams at #14 overall prospect. That is sweet!! Rockies surprised me with their ranking. And of course the Nationals with both Giolito and Turner,,,arguably ,both top 10 prospects in all the minors, really helps their cause. And also the very young Robles gives them added firepower in their rankings. Keith Law rates our system #6 overall. The Cole Hamels trade might turn out to be the Phillies’ Herschel Walker moment, trading their best asset for a huge package of prospects who look like they’ll boost the major league club for years to come. The next step is maximizing their output from this year’s draft, in which they hold the first overall pick. Phillies acquired INF Taylor Featherston from the Angels for a player to be named later or cash considerations. Featherston was designated for assignment last week after the Angels claimed Christian Friedrich off waivers from the Rockies. The 26-year-old stuck with the big club last season as a Rule 5 pick, but he batted just .162/.212/.247 over 169 plate appearances. Phillies general manager Matt Klentak was previously the assistant GM with the Angels, so he’s clearly a fan. A strong defender, Featherston has options remaining, so he can be stashed in Triple-A. he would need a spot on the 40 man, right? LHP Bobby LaFromboise (sp) DFAed. So we quickly gave a raspberry to LaFromboise (framboise is raspberry in French).